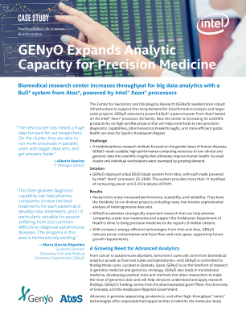 The Center for Genomics and Oncological Research (GENyO) needed more robust infrastructure to support the rising demand for bioinformatics analysis and large-scale projects. GENyO selected a powerful Bull* supercomputer from Atos based on the Intel® Xeon® processor E5 family. Now the center is increasing its scientific productivity on high-profile projects that will help contribute to new ...precision diagnostic capabilities, pharmaceutical breakthroughs, and more efficient public health services for Spain’s Andalusian Region.